In this activity, kids practice writing a narrative text. 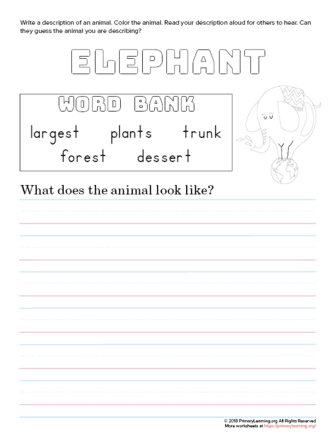 They describe an elephant by answering the questions. Students describe how the elephant looks, where does it live, and what does it eat. Students learn to form written sentences that can be understood by others. They continue to work on proper letter formation and spacing. The writing is based on previously reading the passage about the elephant. Students read their writing to the classmates and ask them to guess what animal it is.